Mid-Life Cruising!!! 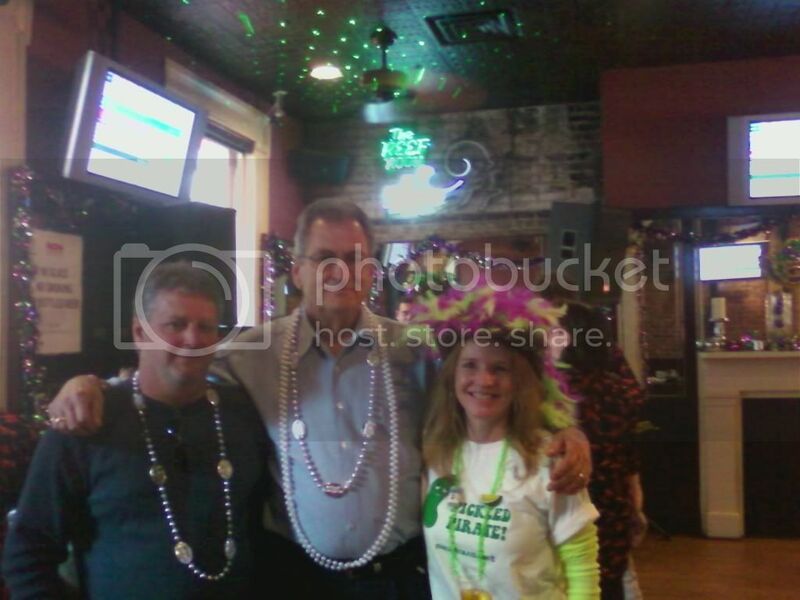 : Mardi Gras 2012! The past several days have been a blur ... could it be because it was Mardi Gras here in New Orleans?! I'm having a hard time getting back into my normal routine. Thankfully tomorrow's already Friday and things should be back to normal by Monday. Although Ken and I had been to the annual boat parade recently, the Mardi Gras celebrations didn't really start for us until this past Sunday. We kicked off the season by walking in the annual "Parade in the Pass" on the beautiful Mississippi Gulf Coast. 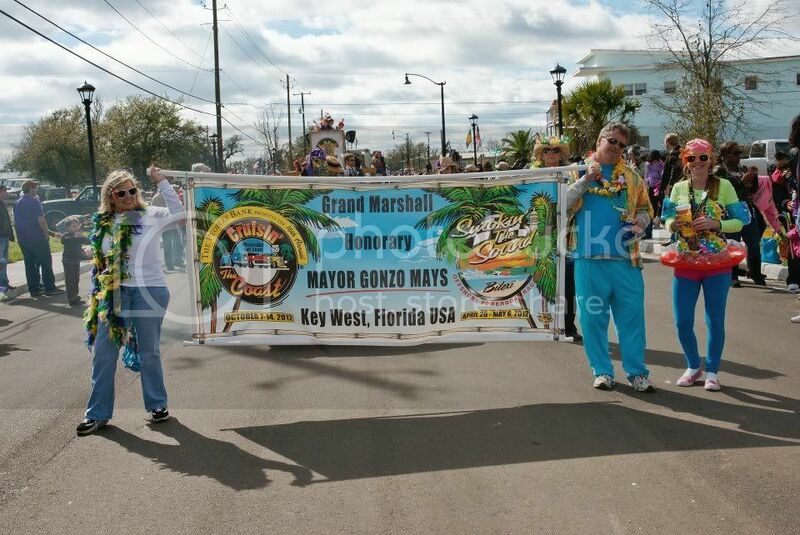 Ken and I were invited by Mayor Gonzo Mays to dress as "tacky tourists" and hold the banner that introduced the Honorary Mayor of the Florida Keys as this year's Grand Marshall. We were honored to be invited, and happily accepted the invitation. After the parade we headed home to meet Ken's dad, Ollie. He was coming for a quick Mardi Gras visit from Naples, Florida. 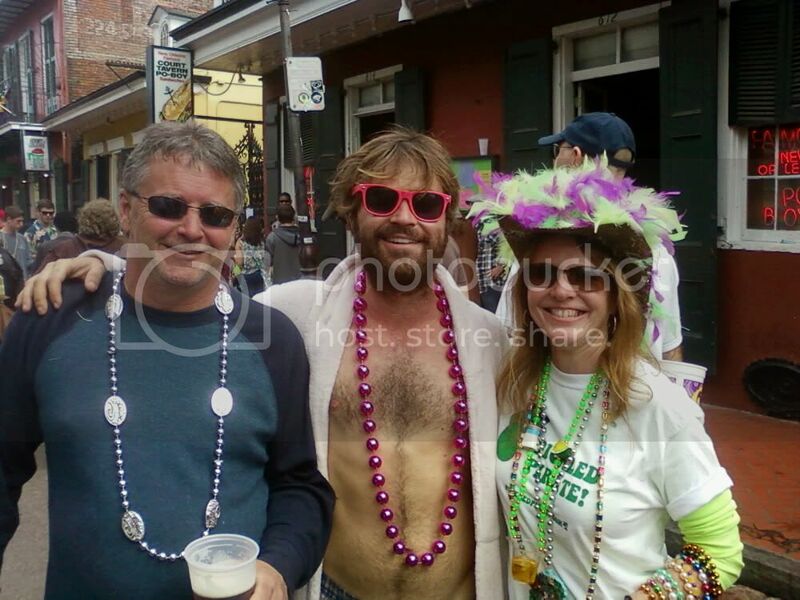 We woke up early the next morning and took Ollie to the French Quarter for Lundy Gras, the day before Fat Tuesday. 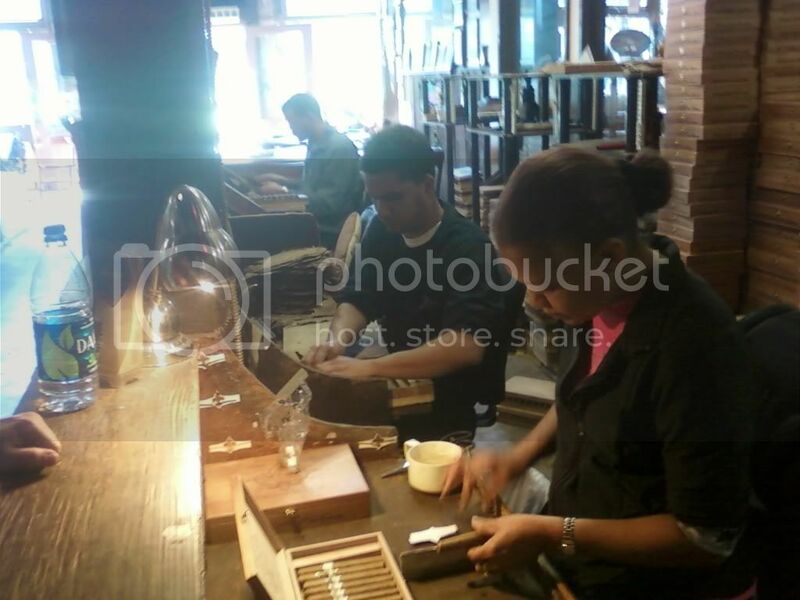 Since Ollie smokes cigars, the first stop was at The Cigar Factory, where cigars are hand-made and Cuban music is always playing in the background. I don't smoke cigars, but I always love walking into this place. I feel like I'm in Cuba! Notice the stack of tobacco leaves behind the guy ... and all those cigar boxes! After a good seafood lunch, lots of people watching and great music we headed back home that evening. The next morning our friend, Judy, joined us for a day in the French Quarter for Mardi Gras. 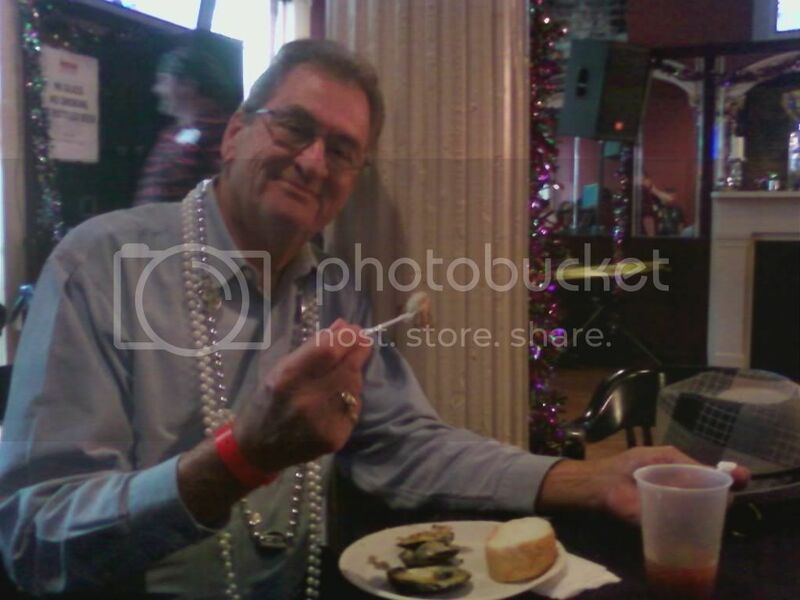 Judy had passes to a private party at Acme Oyster House and at the Royal Sonesta hotel. What more could we ask for?! We started with free seafood and Bloody Marys at Acme Oyster House, then made our way to the Royal Sonesta for more free food, drinks, and beads to throw to the onlookers below on Bourbon Street. Every now and then we'd fill up our cups and walk up and down Bourbon St. to become a part of the crowd. Although I've been to countless Mardi Gras', they never get old. Piece of advice ... skip the parades and come to the French Quarter on Mardi Gras day! Lots of great people, crazy costumes, and good times! Starting things off with Ollie at Acme Oyster House! Ollie's first time eating grilled oysters ... he went back for seconds. Refilled the Bloody Mary too! 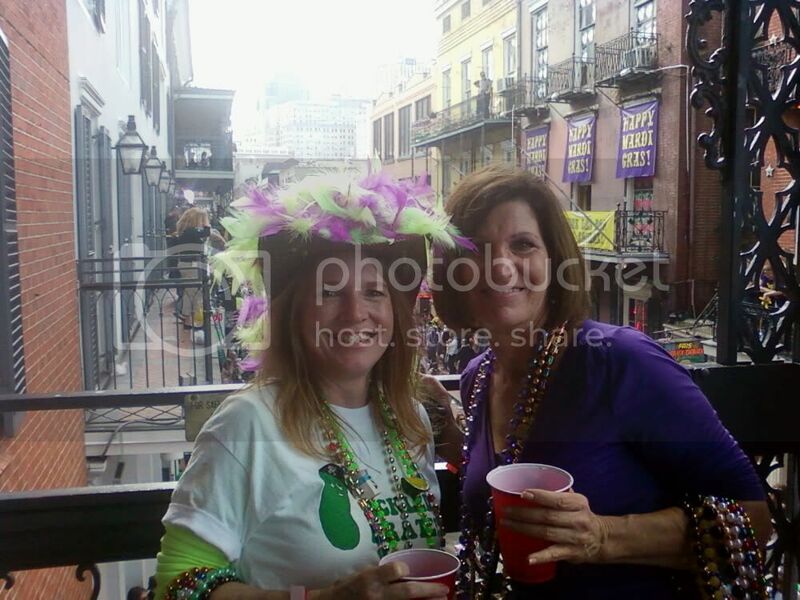 Me n Judy on Bourbon St. balcony ... we are so thankful to her. She shoulda told me to move the damn hat .. LOL! 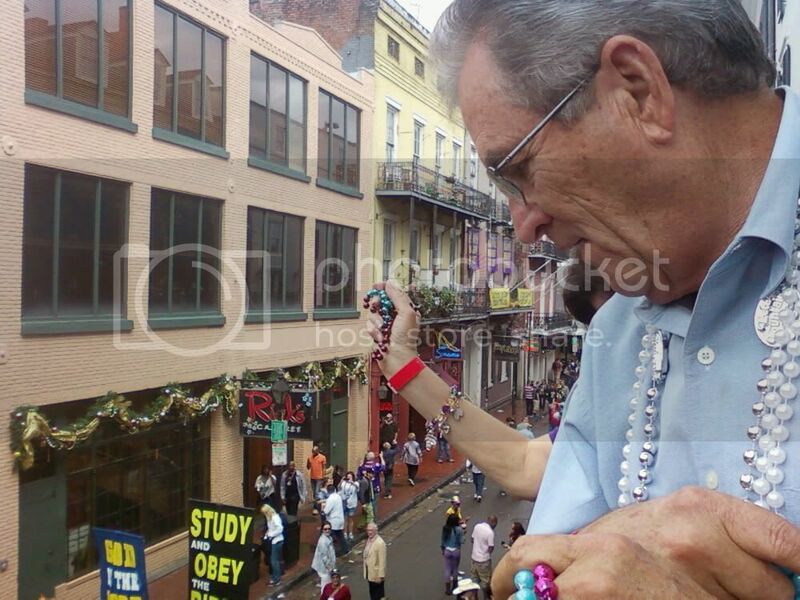 The crowd on Bourbon St., and Ollie throwing beads to them. He had a blast! We ran into our friend, James, who had nothing on but boxers and a robe ... hmmm. We saw so many sights, and some of them I can't post on our site. 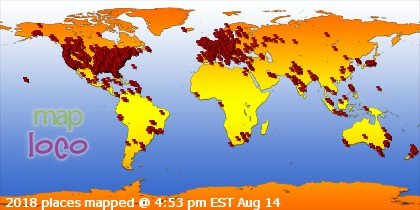 Needless to say, the weather was perfect and we say plenty of skin! 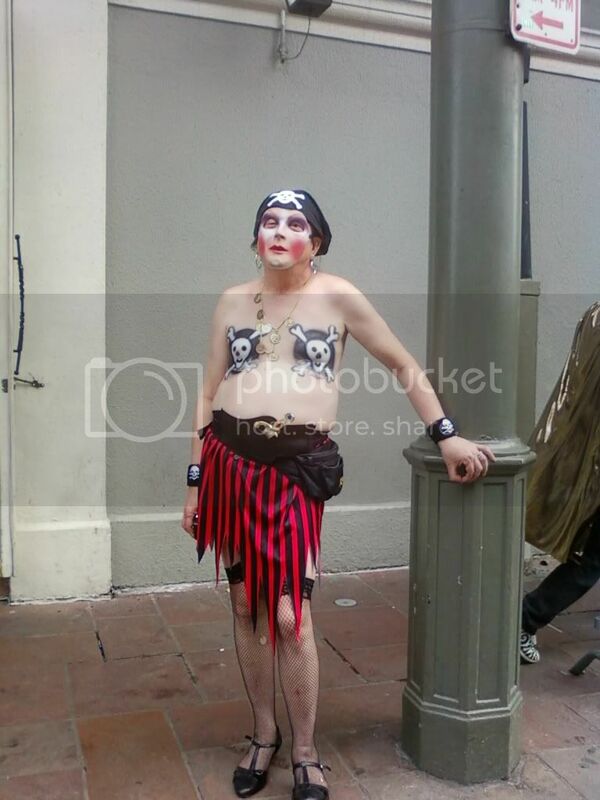 We also saw sights like this "Pitiful Pirate" ... that's what I call him! After a full day of Mardi Gras fun, we headed back home for the night. It was yet another amazing Mardi Gras, and we should be able to squeeze one more in next year before setting sail. 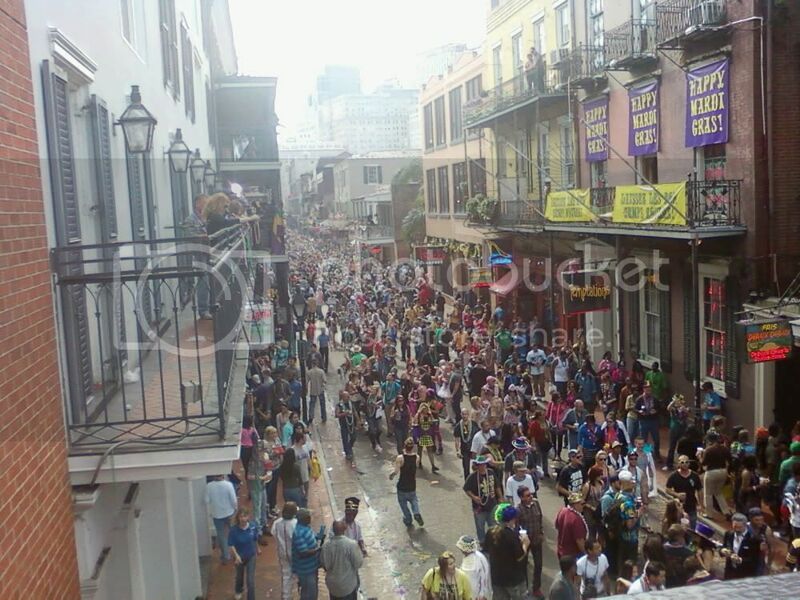 Mardi Gras 2013 should be a real party, cause it's also gonna be the location of the Superbowl. Both of these at the same time in a city like New Orleans ... gonna be wild! 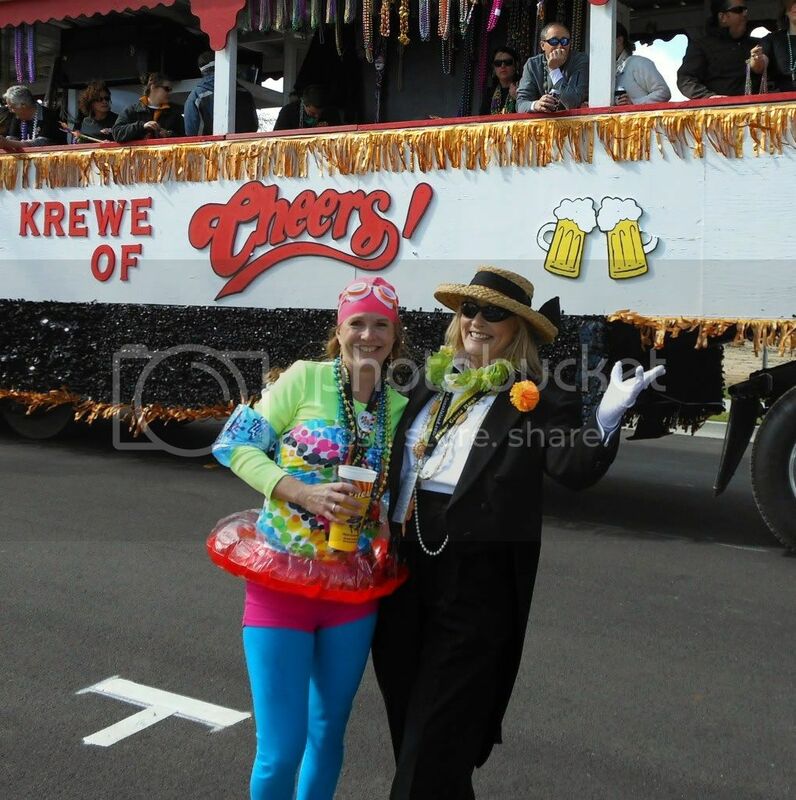 Sometime tomorrow (Friday) I'll have more Mardi Gras pictures on our Facebook page. Please check them out and feel free to share your own Mardi Gras pics. Haven't been? Perhaps it's time to start planning for next year! Sounds like you had a fabulous time. Good for all of you. I've never been but I've never been to N.O. either. Perhaps one day. 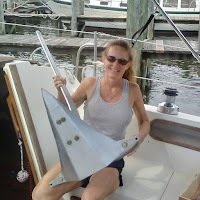 I've some friends that went yesterday and they are due to sail on a cruise out of N.O. Wish we were with then.